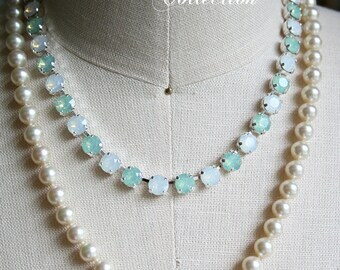 Announcement I'm happy to create select pieces in your choice of custom colored stones, pearls or ribbon. Please contact me for color availability. For updates regarding new listings, sales and announcements, I invite you to follow my blog, eabdesigns.typepad.com, or instagram @juleseab. 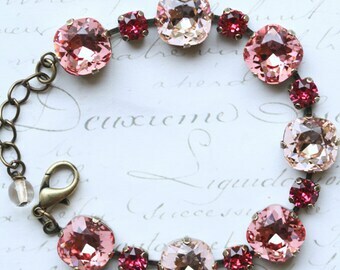 I'm happy to create select pieces in your choice of custom colored stones, pearls or ribbon. Please contact me for color availability. For updates regarding new listings, sales and announcements, I invite you to follow my blog, eabdesigns.typepad.com, or instagram @juleseab. Love, love, love! Well-made, nice materials, and the color -- wow!These were shipped quickly and the packing was secure. I highly recommend this Etsy shop! Congratulations to our summer brides and thank you for choosing the Pemberley Collection! We're having a sale! All earrings are currently 20% off through September 3rd. No coupon code needed. Happy shopping! 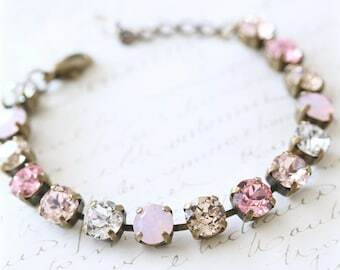 Custom multicolored Swarovski crystal bracelets are now available in the shop, with our new tennis style bracelet design. A collection inspired by charming details, neutral palettes, fresh flowers, and gorgeous gowns. As an avid Jane Austen fan and true romantic, I named my shop the Pemberley Collection. 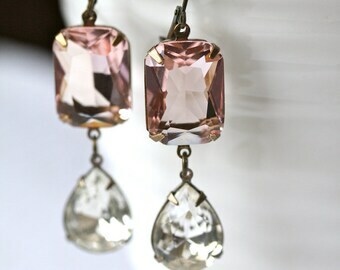 Designed to be worn with your favorite jeans & for special occasions. Custom colors are available for bridal parties. My home studio - a place I love to work from each day. I love creating each piece, as well as packaging your order with care; down to the smallest of details. Hello and welcome to the Pemberley Collection! I personally create each piece from the Pemberley Collection in my home studio, a spacious light filled and organized space I love spending time in. I not only enjoy the creative process of owning two shops here on Etsy, but all aspects of the business side as well. It's my full time job and I love what I do. It's always an honor when a customer or bride chooses pieces from my collection for their special day, or to wear everyday. My second Etsy shop, EAB Designs, features Scandinavian and French inspired home decor, seasonal items and my line of custom stationery. The Pemberley Collection and EAB Designs are proud to have been featured in the following magazines & publications: People, Country Living, Sweet Paul, Cottages & Bungalows, Real Simple, Richmond Bride, Taste of Home, Brides Magazine, House Beautiful, Holiday Decor and Artful Blogging. A girl who appreciates all things creative and is inspired by the smallest of details. To fulfill your order, you must provide Pemberley Collection with certain information (which you authorized Etsy to provide), such as your name, email address, postal address, payment information, and the details of the product that you’re ordering. You may also choose to provide Pemberley Collection with additional personal information (for a custom order for example). Service providers. Pemberley Collection engages certain trusted third parties, such as the postal service, or shipping companies, to perform functions and provide shipping services. Pemberley Collection will share your personal information with these third parties, but only to the extent necessary to perform these services. Compliance with laws. Pemberley Collection may collect, use, retain, and share your information if there is a good faith belief that it is reasonably necessary to: (a) respond to legal process or to government requests; (b) enforce agreements, terms and policies; (c) prevent, investigate, and address fraud and other illegal activity, security, or technical issues; or (d) protect the rights, property, and safety of customers, or others. Access. You may have the right to access and receive a copy of the personal information Pemberley Collection holds about you by contacting them and using the contact information below. Change, restrict, delete. You may also have rights to change, restrict Pemberley Collection's use of, or delete your personal information. Except for exceptional circumstances (where stored data is required for legal reasons) Pemberley Collection will delete your personal information upon request. Object. You can object to (i) Pemberley Collection's processing of some of your information based on legitimate interests and (ii) receiving marketing messages after providing your express consent to receive them. In such cases, Pemberley Collection will delete your personal information unless they have compelling and legitimate grounds to continue using that information or if it is needed for legal reasons. Complain. If you reside in the EU and wish to raise a concern about Pemberley Collection's use of your information (and without prejudice to any other rights you may have), you have the right to do so with your local data protection authority. If you have questions, or concerns, you can contact Pemberley Collection directly through their Etsy Account, via Etsy conversations, as provided in their Etsy Account Info. 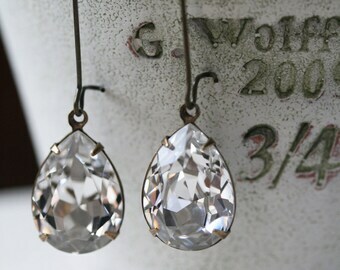 To care for your Swarovski crystal and polished glass jewelry, polish your stones carefully with a soft, lint free cloth to maximize sparkle. Do not soak your crystal products in water. Avoid contact with harsh, abrasive materials and glass/window cleaners. 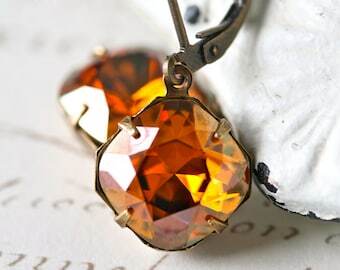 Store jewelry carefully to avoid scratches. Remove jewelry before washing hands, swimming, and/or applying products (e.g., perfume, hairspray, soap, or lotion), as this could harm the metal settings and reduce the life of the plating. I'm happy to adjust the length of bracelets and necklaces to fit your personal needs. Please contact me for confirmation. 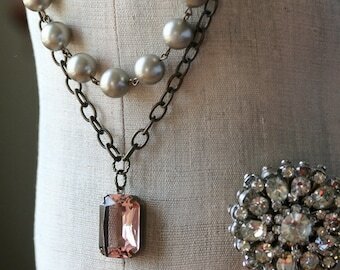 I love working with brides in selecting pieces for their bridal party. 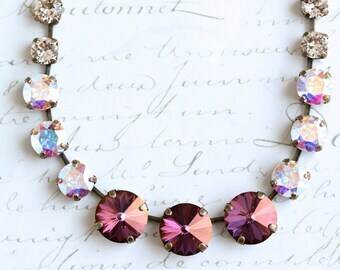 Custom colors can be ordered in Swarovski crystals, faceted polished glass stones, or ribbon.